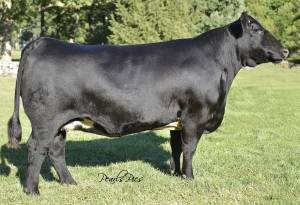 TradeCraft D010 is a powerfully constructed Right to Love 015U son that is flexible in motion and offers a striking profile, a combination that will make him capable of producing both elite quality show heifers and high performing rugged sons as well. TradeCraft is a maternal brother to HPF Quantum Leap Z952 (Grand Champion Bull at 2014 American Royal, 2014 North American, and 2015 Fort Worth Stock Show) and THSF Loverboy (Grand Champion Bull 2016 National Western). 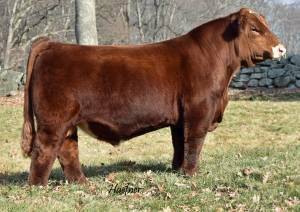 Right to Love 015U is also responsible for multiple Living Legacy Sale toppers, including the recent $70,000 HPF Right to Love C083, along with many others. 015U is a donor that just doesn't miss and we believe TradeCraft combines proven pedigree and stunning phenotype into one complete made, well-balanced package.